The Bitter Business is delighted to be named in the TOP 100 BRANDS and influencers for Social Selling. The report complied by Onalytica was to identify which Social Selling brands and individuals were leading the online discussion. 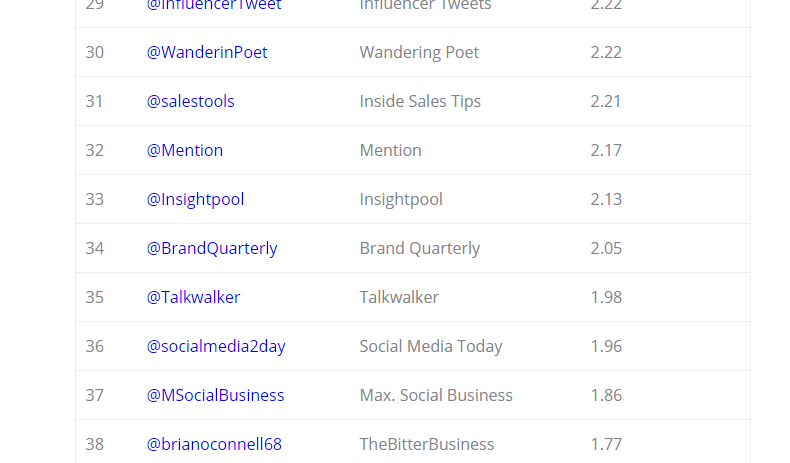 They analysed 263K+ tweets from 16 November 2015 – 4 February 2016 mentioning the keywords “Social Selling” OR socialselling OR socialsales OR “social sales” and identified the top 100 most influential brands and individuals leading the discussion on Twitter. In the top 100 brands there is organisations such as Salesforce and Hootsuite and some top industry resources such as SocialMedia Examiner and Social Media Today.While 38 on the global list is a great achievement, it should be noted that The Bitter Business is flying the flag for social selling from Ireland. Social sellers realize 66% greater sales achievement than those using traditional prospecting techniques (Sales Benchmark Index).